I’ve just ordered the new Sigma 8-16mm F4.5-5.6 DC HSM Ultra Wide Angle Lens which had just been released in the past few weeks. This lens is designed for APS-C (crop sensor) format D-SLR’s and will effectively be a 12-24mm Ultra Wide lens on my Nikon D90. I’d been interested in adding an ultra wide lens to my kit bag for a while now and was almost settled on the Tokina 11-16mm f2.8 but when they announced this new Sigma which went down to 8mm and was not a fisheye back in February I was sorely tempted and torn. Even before I actually get my hands on it I’m aware of a few potential limitations with the lens. It has a much higher variable minimum aperture (4.5-5.6) than say the Tokina (which has a constant 2.8) and as the front element of the lens is very bulbous you can’t attach filters to the front of the lens and the lens hood is fixed and can’t be removed. However given the use cases of this lens I’m not particularly concerned with any of these limitations and am extremely interested in creatively using the perspective distortion of the 8mm (12mm) 115 degree field of view and it’s 24cm minimum focusing distance. I’m sure I’ll be posting more after it arrives and for those who are interested I paid $740 AUD delivered. Update: It arrived yesterday which means it took less than 2 days from time of order to arrival (from Hong Kong) – got to be happy with that! I took a few photos with it yesterday and will try to take some more over the weekend and put up a new post with some examples and comments – however initial impressions are that I’m very happy with the lens – it’s sharper than I had expected from such a wide distorting lens, CA seems very controlled (presumably the FLD glass), it’s also smooth, fast and quiet. We spent the late afternoon down on the inner harbour and captures a few shots whilst I was there. 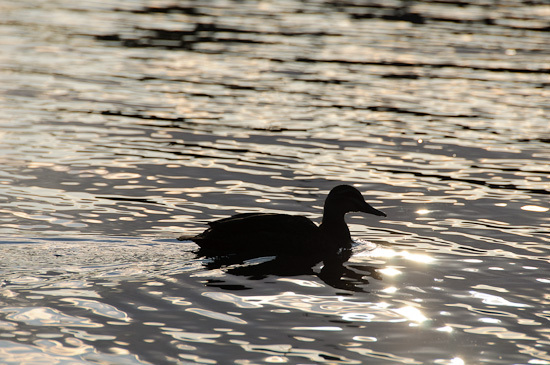 This first see’s a duck swimming on the water with the setting sun behind (directly in front of the camera) creating the silhouette and the mirrored water surface. This second is another HDR (High Dynamic Range) shot created from three bracketed exposures at 0, -2 and +2 EV. 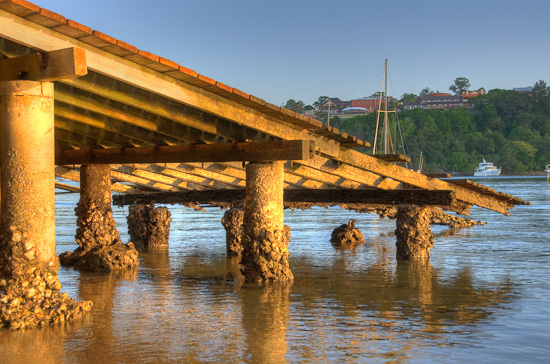 The sun was just setting (to my right) giving this fantastic golden glow to the wood and the piers and the HDR process has lifted the shadowy area under the pier. 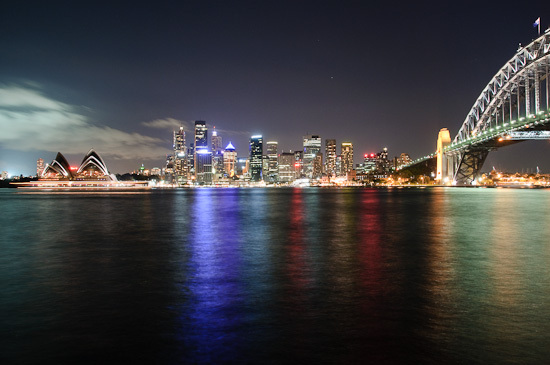 Later we all went to dinner at a nice little Thai place in the shadow of the Sydney Harbour Bridge and afterwards we walked around the harbour foreshore under the bridge. I didn’t have a tripod with me so I had to make liberal use of some stone walls to take these very long exposure shots. 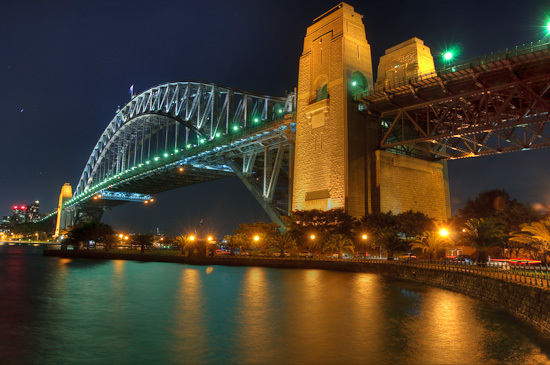 The first is an HDR of the Harbour Bridge itself and was created by merging four manual exposures at 4, 8, 10 and 15 seconds in length. I was very happy with the way this turned out and how low the noise was (both from the long exposures and as a result of the HDR process). This last is a single frame manual long exposure of 15 seconds which also turned out pretty much as I had hoped for.